If you spend any time following technology news on the internet, you’ll know it’s over-run with rumours of new products [particularly in the case of a fruit-named company from Cupertino]. In the 80s it was just the same. Check out this News page from PCWs debut issue. 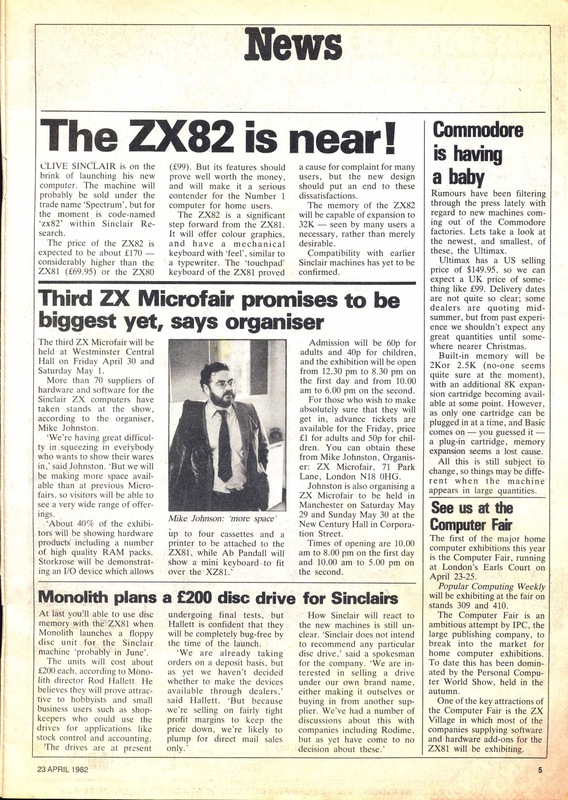 Here we see the first rumour of the ZX Spectrum, referred to here as ‘the ZX82′ *and* the Commodore MAX. This entry was posted in Popular Computing Weekly, ZX Spectrum by retrogeek. Bookmark the permalink. Actually, it did have a mechanical keyboard, but it was an OPTION; At the time I had $1000 to spend and while the C-64 was inviting, there was a lot it wouldn’t do, plus the ZX could run forth on a native chip (ZX basic was amazing only in that it was only 8K) — I bought the full kit, 64K ram expansion, the “typewriter” keyboard, printer and forth, and seems to me I was a shade under budget so I bought a few applications that turned out to be complete junk I could re-write in an afternoon (flight sim, accounting and something else); the forth-based astronomy calculator I wrote for that machine launched a computing career that lasted a very respectable 23 years!